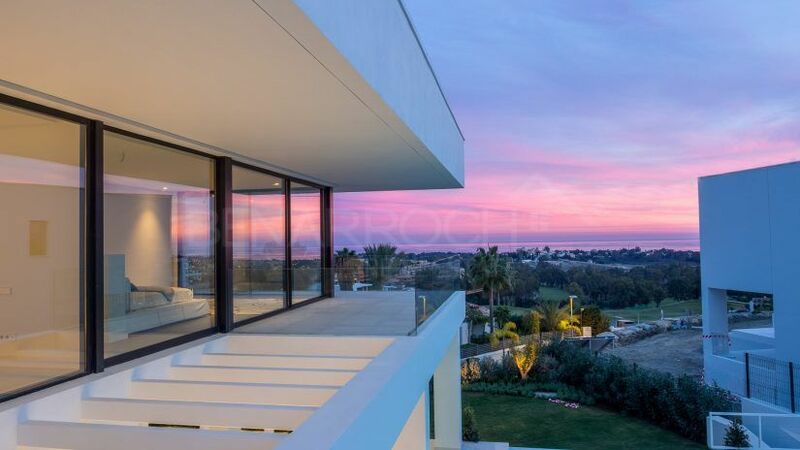 In the consolidated area of La Alqueria, north of the Atalaya golf course, in Benahavis, is located Mirabella Hills, luxury villas in a private residential built in height and with breathtaking views. La Alquería is an urbanization made up of villas, generally of modern contemporary style and carefully designed apartment residences, which form a spectacular setting due to their proximity to the Atalaya Golf and Country Club. In the área we can find a supermarket, the international school Atalaya, the mentioned golf club Atalaya equipped with two courses of 18 holes each, clubhouse with restaurant and only ten minutes to Puerto Banús with its wide range of restaurants, cafes, boutiques and shopping centers. Also only ten minutes from La Alquería and the residential Mirabella Hills, we access the village of Benahavís, widely known for its many restaurants and its typical Andalusian physiognomy and in a 20-minute walk we reach both Marbella and Estepona. Mirabella Hills is a modern complex consisting of 14 luxury villas in a private community with security and entrance barrier, with built areas of 653 to 907 square meters implanted on plots of 1.222 to 1.911 square meters. The houses, developed in two floors and basement, have five bedrooms, large living room, kitchen open to the dining room, large terraces facing the pool, solarium and basement with gym, cinema room, wine cellar, bar and sauna, with the possibility of customizing according to preferences. Each property has a private garage and garden. Spacious and elegant, the houses have three types of designs, always respecting the straight lines focused on giving great luminosity to all the rooms while enjoying the magnificent views towards the Mediterranean coast and the golf that provides its situation in height. The villas in Mirabella Hills, in Benahavís, have been built with top quality materials and among their equipment we highlight their large sliding windows with double glazing, glass railings on the terraces, underfloor heating on the main floor and bathrooms, air conditioning throughout the house cold heat, domotic system for lighting control and electric blinds, pre-installation of alarm, automatic irrigation in gardens, solar panels and lighting in the garden. The Benarroch Real Estate team, from our office in El Pilar Shopping Centre, on the New Golden Mile of Estepona, just a few minutes from this amazing residential complex, invites you to visit us to personally inform you about all the features and availability of Mirabella Hills, luxury villas in La Alqueria, Benahavis. The right price can vary depending on the chosen model of villa.